On Thursday, September 27th, NBFA held an annual high school expo that hosted competitive schools from in and outside of Fairfield County. 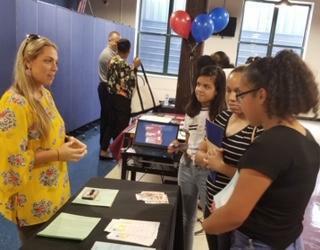 Schools in attendance included St. Joseph, Lauralton Hall, Kolbe Cathedral, Notre Dame, Hopkins School, Bridgeport Military Academy, Fairchild Wheeler, and Bullard Haven technical. Throughout the night a steady wave of parents and students meandered the various booths to speak to school representatives regarding the enrollment process, timeline, available scholarships, extra curricular activities and upcoming visitation opportunities.